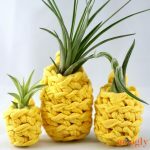 Pineapples have been a home decor staple for generations, and they are having yet another moment in the sun. 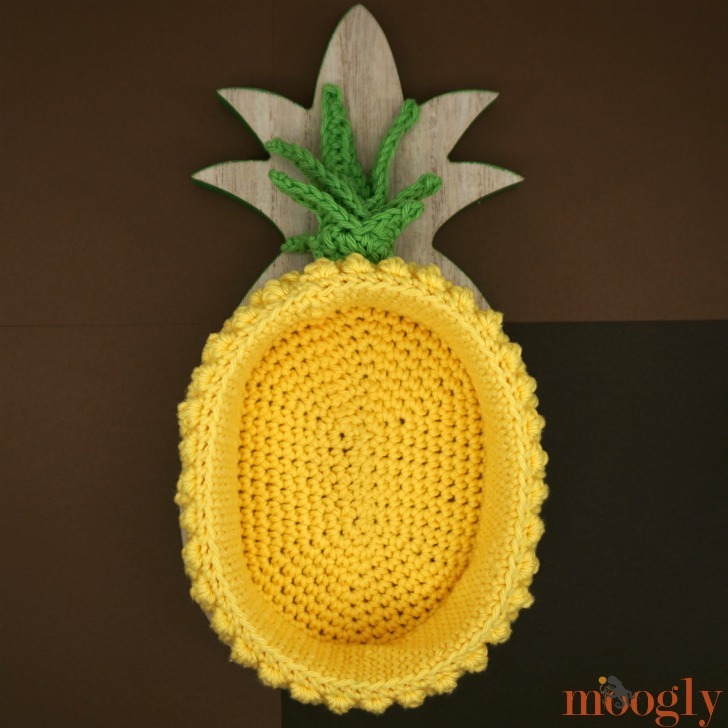 To celebrate this lucky fruit – and the return of summer – I’ve designed the Pineapple Basket. 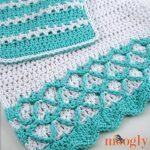 And I’m sharing the free crochet pattern right here on Moogly! 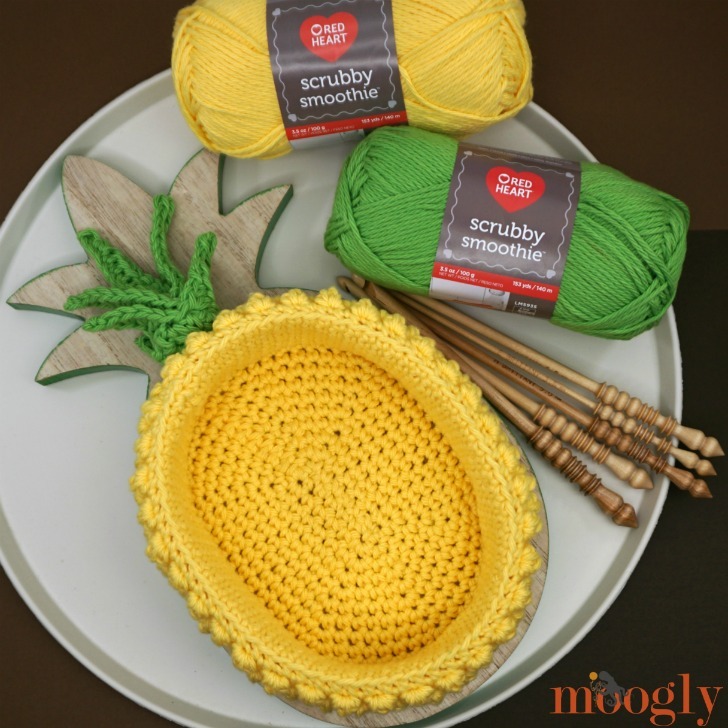 The free crochet Pineapple Basket pattern features Red Heart Scrubby Smoothie and a few clever stitches and tricks to create a pineapple shaped bowl you’ll love to use and show off. 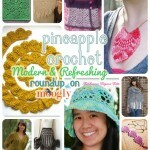 The Pineapple Basket pattern begins with a simple crochet oval. While I’ve taken it out to 10 rounds, you can stop increasing at any time if you’d like a smaller crocheted pineapple bowl. Or you can add more rounds in pattern to make it even bigger! 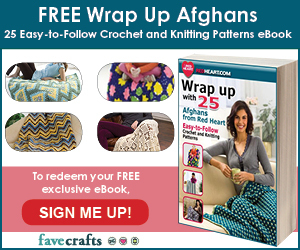 As long as you have an even number of stitches, the rest of the pattern works just fine. 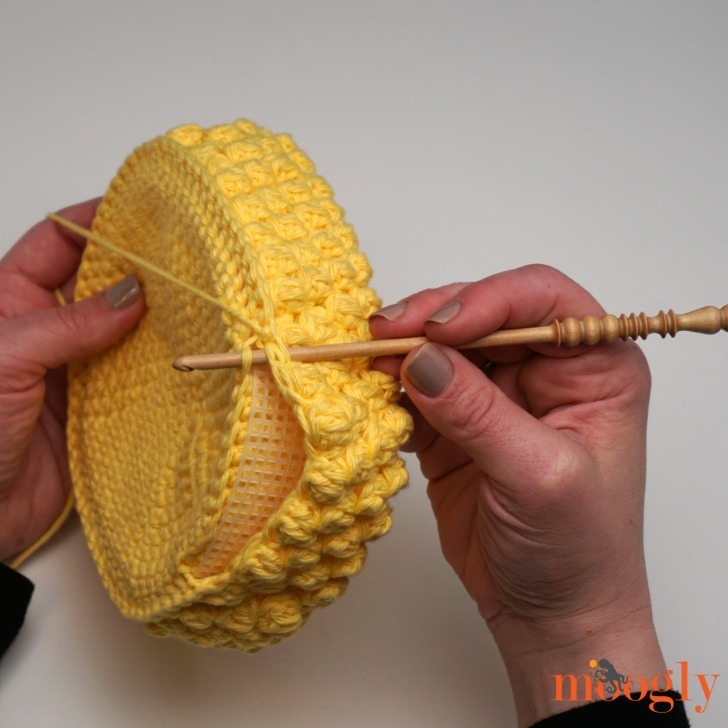 After you make the oval, you make the inside sides of the bowl, and then finally the small bobbles that create the outside sides – one quick fold, add the crown, et voila – a crocheted pineapple basket, ready to use! Size: Basket portion is 7 1/8″ long x 5 3/4″ wide, excluding crown. To make a smaller basket, simply stop increasing between Rnds 1 and 10 when you have the size desired, and skip to Rnd 11. To make a larger basket, continue to increase in pattern after Rnd 10, before continuing with Rnd 11. To create an oval, the first rnd is worked into both sides of the foundation chain. The leaves of the crown are made in one long strip that is then set aside until assembly. 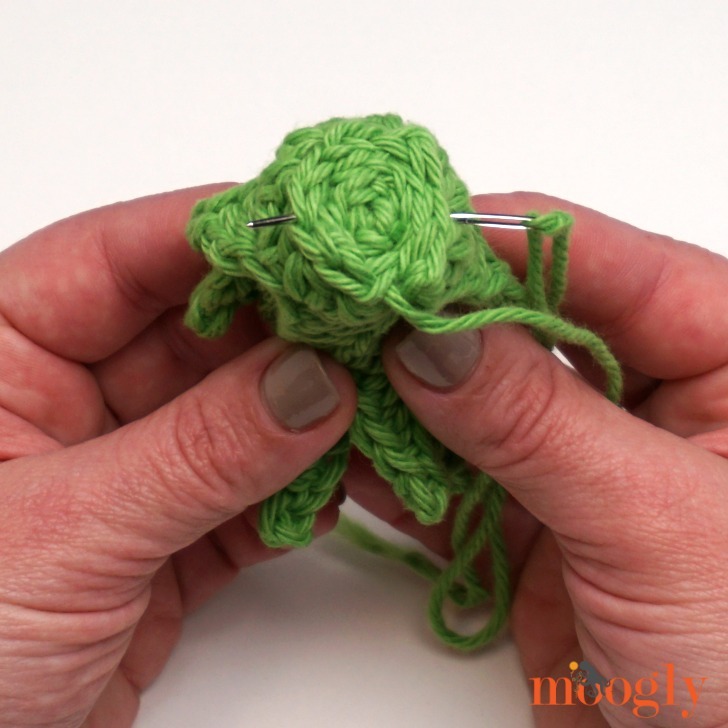 Do not break the yarn between the leaves – just keep crocheting. 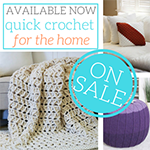 Crochet into the back/underside of each chain for best results. Leaf 1: Ch 5, skip the ch closest to the hook, sl st in next ch, sc in next ch, hdc in next st, dc in last ch. Leaf 2 and 3: Rep Leaf 1. Leaf 4: Ch 7, skip the ch closest to the hook, sl st in next ch, sc in next ch, hdc in next 2 chs, dc in last 2 chs. Leaf 5 and 6: Rep Leaf 4. Leaf 7: Ch 10, skip the ch closest to the hook, sl st in next ch, sc in next ch, hdc in next 3 chs, dc in next 3 chs, tr in last ch. Leaf 8: Ch 12, skip the ch closest to the hook, sl st in next ch, sc in next 2 chs, hdc in next 3 chs, dc in next 3 chs, tr in last 2 chs. Leaf 9: Rep Leaf 8. 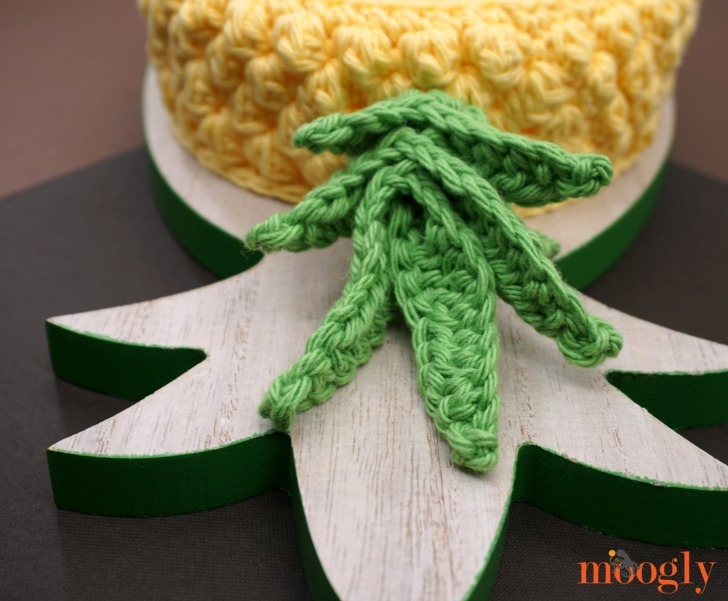 Finish Crocheting the Leaf Strip: Turn leaves to work across the last st of each leaf, ch 1, hdc 4 along each of the last (tr) sts of Leaves 9, 8, and 7, hdc 3 along each of the last (dc) sts of each rem leaf; break yarn leaving an 18″ tail. Prep the Leaf Strip: Lay Leaf Strip on a clean, non-textured surface. Spray each side lightly with spray starch, and allow to air dry flat and straight. Rnd 23 and 24: Rep Rnd 21 and 22. Insert plastic canvas pieces between the bobble section and the sc sides, with the ends overlapping at the sides of the basket. (Rnd 25 beginning): Ch 1, sc through each st AND the unused Back Loop from Rnd 11, directly below, sandwiching the canvas between the layers of crochet until you are about 3-5″ from finishing the rnd. Secure loop with a stitch marker. Roll the Crown up, RS out, starting with Leaf 9 and ending with Leaf 1 on the outside. 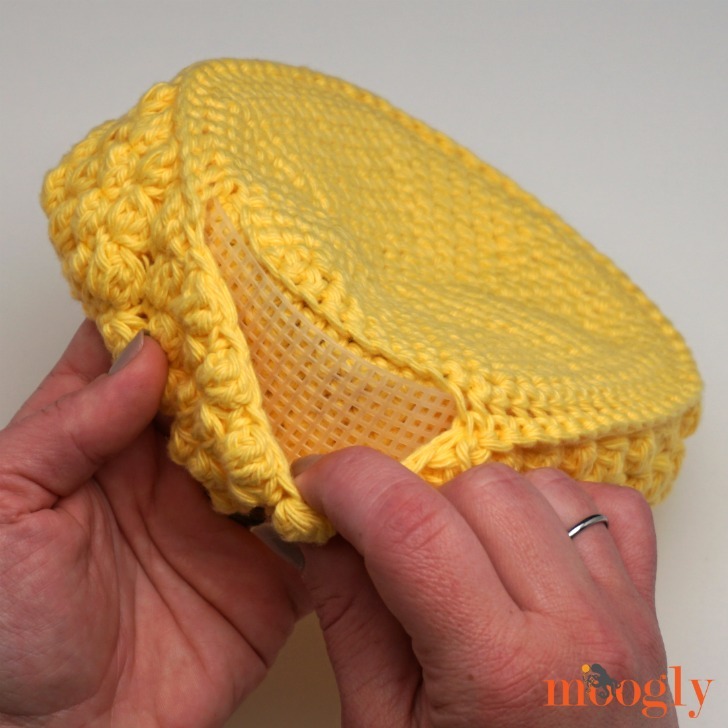 Using the long tail left behind, secure the base of the Crown and then sew the Crown to the top of the pineapple, going through the bobble portion and putting a few stitches through the plastic canvas if desired. Finish off. 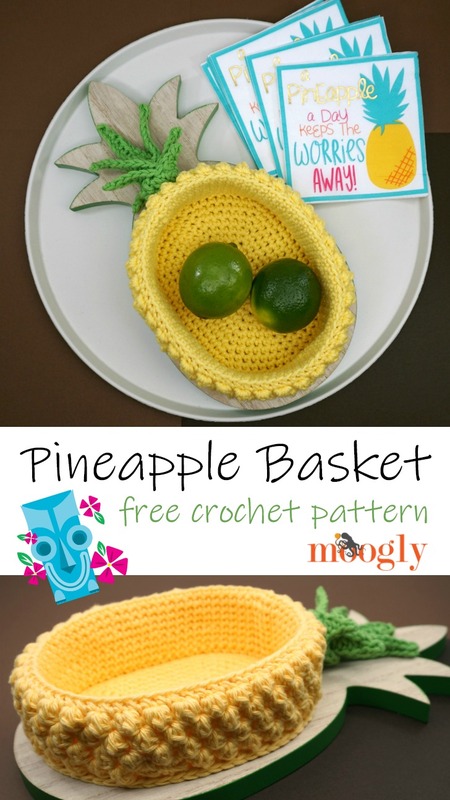 I hope you’ve enjoyed making your own Pineapple Basket! What will you put in yours? There are so many possibilities! If you make the Pineapple Basket I’d love to see a photo. 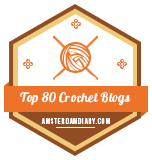 So if you share it on social media, be sure to tag me @mooglyblog or #mooglyblog – and happy crocheting! Written pattern copyright Tamara Kelly 2018, all rights reserved. Please do not reprint or repost this pattern, but please do link to this page to share this pattern with others. To print or download, use the Print Friendly button below, or go to PrintFriendly.com, or right-click to copy and paste it into a word processing document if those options do not work for you (please note that Print Friendly is a free outside website that the button links to, and you can click here for a tutorial on how to use it, but I cannot provide additional technical support for this service). If you wish to make items for sale from this pattern or translate it to another language, please visit the About page for details. 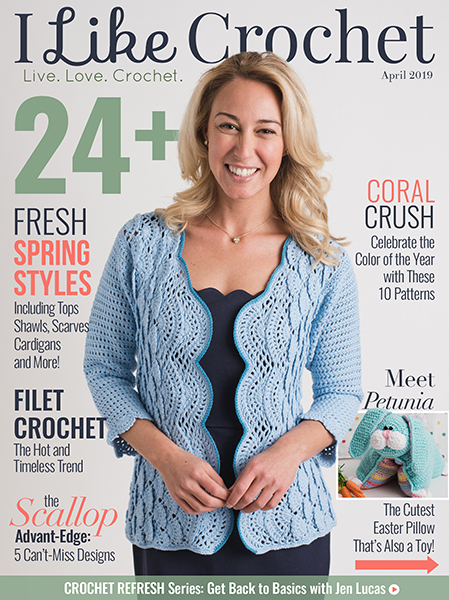 Thank you to Red Heart Yarn, Brittany Needles, and Clover USA for providing the materials for this pattern. Way cool!. Can’t wait for the video. That is so very cute and “summery”. Liked it a lot an shared it. 😀 Thanks so much Clotilde! This pineapple basket was just added to my very long list of future projects. 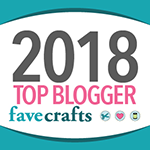 Speaking of that list, I saw a crocheted rug on your site some time ago and I forgot to save it. All I can remember is that it was 42 inches in diameter. Does that sound familiar to you? If not, I am mixing my facts about this rug. I want to make one for my bedroom. Any help is greatly appreciated. Oh I’m so glad! Thank you Pat! Wow!! Looks so pretty. I shall try it some times. Thanks for the pattern. Thank you for the pattern AND the much appreciated video tutorials! fun project! 🙁 I’m happy to try to help if I can answer any questions! Hi Debbie! Did you watch the video? I’m happy to answer any questions that I can! I did but it didn’t get to how you attach the bobbles. I’m sorry to bother you. I just don’t understand the pattern. I’m a novice at this. I’ve tried making the Oval 10 times and that shouldn’t be hard to do I know. Thanks for your help. I have an oval shaped bowl for chips and guacamole. I’m going to try to make it the right size to place the bowl inside the pineapple! Shouldn’t be too difficult if I work at it. I’ll try to post a pic when it is done. This is just what I have been looking for. Thank you so much! Oh that’s such a fun idea! 😀 I can’t wait to see!! 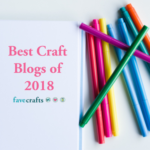 A hint on making ovals in the right proportions for your project – measure how big you want it to be, for example 5″ x 8″ and make the beginning chain the DIFFERENCE between the length and width. In this case it would be 3″ I’ve had to adjust a couple of oval tablecloths to fit certain tables, and I came realize that “rule of thumb”. after round 10… if I wanted to make it bigger how would I go about the increases and how many stitches do I need around to do the bobble stitch? Trying to make this into a Possum bed for a wildlife rehabber that has a baby named Pineapple!! Starting in rd 3 you say 4sc, 4th rd you say 6sc. Do you mean 4sc in the next st in rd 3 and in rd 4, does 6sc mean in one st? I’m confused about this cause you usually say in the next stitch but these just say 4sc or 6sc respectfully. I’m fairly new at this so please help me understand what your instructing me to do. Thank you!